Current therapies for multiple sclerosis target a person's immune system. While they have been found to decrease the number and severity of MS relapses, there is still no cure for MS, so people may continue to become more disabled as their disease progresses. But now experts are examining therapies that target myelin—the protective, fatty coating surrounding nerve fibers that is damaged and destroyed in MS.
Let's take a closer look at the role of myelin in multiple sclerosis, and how repairing it may restore neurological function and slow down or even stop MS in its tracks. In a healthy person, nerve cells send impulses to each other along a thin fiber that is attached to the nerve cell body. These thin projections are called axons and are surrounded by a fatty, white sheath called myelin. Serving as a protective or insulating cover, myelin allows nerve impulses to travel rapidly and effectively. In multiple sclerosis, a person's immune cells attack myelin (and eventually the axons too) in their brain and/or spinal cord. Repeated attacks on myelin eventually lead to scarring. When myelin is scarred, nerve impulses cannot be properly transmitted—they either travel too slowly or not at all. Eventually, axons degenerate (lose their ability to function) as a result of chronic myelin loss, leading to nerve cell death. Depending on where in the central nervous system myelin is attacked, symptoms like sensory disturbances, vision problems, spasticity, and bladder problems begin to manifest. This is why the symptoms of MS vary widely from one person to another, as the location of myelin attacks varies within the central nervous system. In addition to the variable sites of immune system attacks in the brain and spinal cord, the timing of these attacks is also unpredictable—although, experts have identified potential triggers like stress or the postpartum period. While current disease-modifying MS therapies focus on how to prevent a person's immune system from attacking myelin, now scientists are looking into how myelin can be repaired once it has been damaged by the immune system. The hope is that if myelin is repaired, a person's neurological function may be restored, and a person's MS can stop getting worse (or at least slow down). The good news is that some studies have already shown that preserving and restoring the myelin that surrounds axons can increase nerve cell survival. 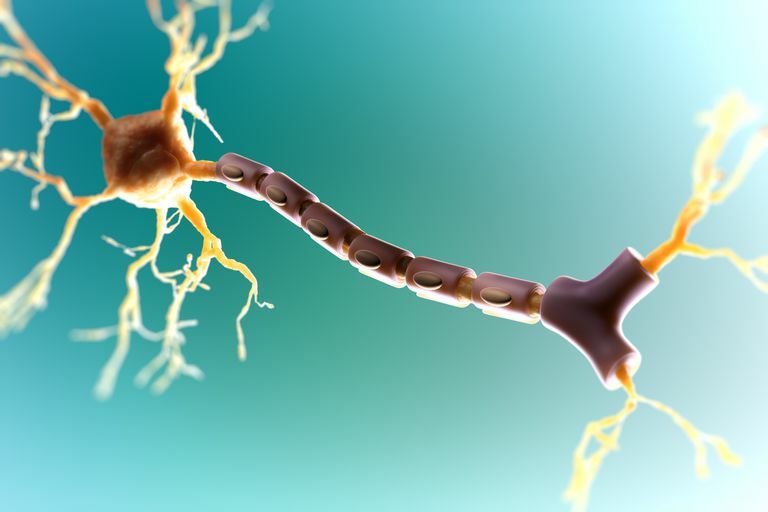 Since a person's MS-related disability is linked to the degree of nerve cell death, by repairing myelin and protecting nerve cells, experts hope we can stop the progression of disability in people with MS. The research on restoring function and repairing myelin in multiple sclerosis is still very early. Nonetheless, it is exciting and potentially a step closer to ending MS once and for all. In one study in Lancet, an over-the-counter allergy medication called clemastine was examined to see if it could promote myelin repair in the brains of people with MS. In this study, 50 people with relapsing MS and optic nerve damage were randomly and blindly given either clemastine by mouth twice a day or a placebo pill for 150 days. After 90 of those 150 days, the participants switched therapies, meaning those who received clemastine initially received placebo and vice-versa (for the last 60 days). The participants underwent visual evoked potentials, which measures signal transmission from the retina of the eye through the optic nerve to the visual cortex—the region of the brain that processes images, or in other words, converts what you see into an actual picture. Results revealed that the delay in visual evoked potential was reduced by 1.7 milliseconds per eye for the time that people were being treated with clemastine. This reduction in the nerve transmission delay suggests that myelin repair is occurring along the optic nerve signaling pathway. One caveat of the study is that the dose of clemastine was higher than the maximum dose that is normally recommended, so not surprisingly, it did cause some fatigue in the participants. Other early studies are recruiting patients or are currently underway regarding medications that may help promote myelin repair and protect nerve cells in the central nervous system. For example, Phase 1 trials (very early) are ongoing for both Guanabenz and Olesoxime. Guanabenz (a medication previously approved by the FDA for treating high blood pressure) has been found in animal studies to increase the survival of cells that produce myelin (called oligodendrocytes). It has also been found to reduce the number of immune cells that collect in the brain and spinal cord. Another medication called Olesoxime, which was originally developed to treat amyotrophic lateral sclerosis, has been found to both accelerate the maturation of myelin-producing cells in the brain and spinal cord and enhance myelination. A third drug called Ibudilast was found to slow the rate of brain atrophy (shrinking) compared to placebo in a phase II trial at Cleveland Clinic for over two hundred patients with either primary or secondary progressive MS. The idea that a drug may be able to promote myelin repair in the central nervous system is fascinating. It suggests that the brain can self-repair, restoring neurological function that was once compromised or lost. That being said, this is all still very new and very early. So while exciting for those of us with MS, try to remain patient as the research unfolds. Green AJ et al. Clemastine fumarate as a remyelinating therapy for multiple sclerosis (ReBUILD): a randomised, controlled, double-blind, crossover trial. Lancet. 2017 Dec 2;390(10111):2481-89. Harlow DE, Honce JM, Miravalle AA. Remyelination therapy in multiple sclerosis.Front Neurol. 2015;6:257. Nave KA. Myelination and the trophic support of long axons.Nar Rev Neurosci. 2010 Apr;11(4):275-83. Villoslada P. Neuroprotective therapies for multiple sclerosis and other demyelinating diseases. Multiple Sclerosis and Demyelinating Disorders. 2016 1:1. Zhornitsky S et al. Quetiapine fumarate for the treatment of multiple sclerosis: focus on myelin repair.CNS Neurosci Ther. 2013 Oct;19(10):737-44.